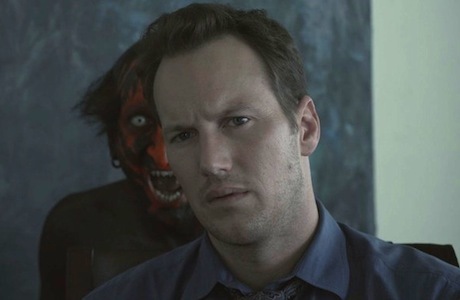 Insidious: Chapter 2 is a smart, fun and spooky follow-up to the original, serving the role of a sequel, prequel and a little something extra. Since its plot is inextricably tied to the first film (hence the use of "chapter"), this isn't a point viewers can jump on at and have an experience with even a fraction of the impact those up to speed will. By nature of its construction, Chapter 2 completely alters the way you previously saw the initial instalment of this natural successor to the Poltergeist franchise. James Wan's foreboding story of a family terrorized by ghostly possession picks up where the last one left off, but not before a pre-title flashback scene to professional medium Elise Rainier (Lin Shaye) first encountering Josh Lambert (Patrick Wilson) as a boy. This is when she put in place the mental blocks that stopped him from astral projecting to terror town every night. If you recall (and if you don't, go watch the first movie), that mental block is what he needed lifted in order to enter a realm of consciousness called "the Further" and find his son's lost astral body. Following this set-up/history lesson, there's a brief investigation into Elise's death by the police to refresh the audience on a few pertinent facts that will come into play. With that out of the way, and Wan visually reminding us of how potent his use of isolating imagery can be, the reunited Lambert family move in with their grandma (Barbara Hershey), seeking a fresh start. However, try as they might to deny it, each one of them knows that whatever attempted to steal their son's body isn't finished with them yet. Elise's nerdy disciples try to help fill the professional knowledge void, in light of evidence that another trip to the Further might be required, and wind up providing comic relief more than day-saving skills. Many of the same strengths and weakness remain this time around: Wan is becoming a modern master of generating creepy atmosphere via his judicious use of lighting, stately, chilling cinematography and a classically creepy score, but the visual limitations of the Further still feel like budgetary shackles that hobble the film's full potential more than an artistic preference. The returning cast, including Ty Simpkins, as Dalton Lambert, shouldering increased responsibilities, manages to sell even the most outlandish scenes, with Patrick Wilson, in particular, stepping up to meet the requirements of his decidedly juicier role. Introducing elements of body betrayal and self-identity horror, Wan raises the stakes, expands upon the lore of his world, provides a reasonably satisfying resolution and points the way forward, should there be demand for further entries in the franchise.